When you start your driving lessons in Hitchin with us, you will receive a free lesson manual, theory test training and have access to beginner test route videos to help you pass faster. Our only goal is to help you pass your test as quickly as possible. Our instructors are very accommodating, so they can pick you up from the popular North Hertfordshire college where we have served 100's of pupils in the past or your local sixth form. Little bit older? No problem, we can pick you up from work; be it on the Hitchin High Street or any surrounding area. Pupils who have recently passed with us in Hitchin. driveJohnson’s driving school in Hitchin has been serving customers in the area for over 10 years. We provide fantastic instructors that know the local area and test routes well, whether you choose the Letchworth or Stevenage test centre. 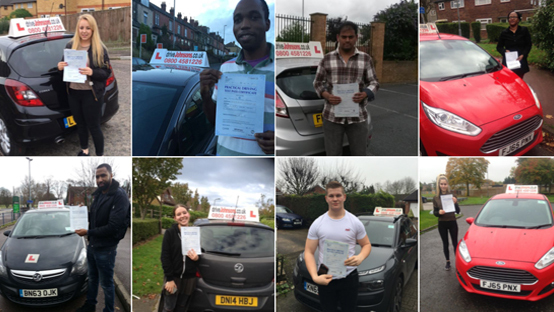 The benefits of learning with a driving instructor that knows your area well is massive – You will learn faster, have a much higher chance of passing first time and ultimately save money. We'll have you driving on the A414 and parallel parking like a pro in no time at all! How much do driving lessons cost in Hitchin? I am very grateful for all the hard work by Simon on making it a success story for me. Great teacher and very focused. Took the far of driving out of me and put the concept of road safety instead. Thank you Simon and DriveJohnsons! Brilliant instructor - Maintains a calm and happy approach to lessons. He will always go above and beyond to ensure you're driving safely and learning properly. Gives honest and helpful feedback at the end of every lesson with handy debriefs. Really flexible and tailors every lesson to help you as a learner. Passed 1st time within 3 months thanks to Simon. Would 100% recommend. Passed my test last just last week all thanks to Simon! He was a great instructor, explained things well and had a good sense of humour! Would definitely recommend him to any learner driver, thanks Simon!! Just passed my practical first time with only two minors, Simon is an excellent instructor that will stop at nothing to make sure you are ready for driving. Makes you feel comfortable the whole way through and is consistently reassuring through out. I can't recommend him enough. Great instructor and all round great guy! Alec is very patient with his learners. I passed my driving after driving him crazy with the reverse on the corner. I would recommend you to do some lessons with him. Fantastic driving instructor couldn't have had better than Simon puts you at ease from day one right thought to test day. Kevin was a pleasure to have as an instructor. He really helped me gain the experience and knowledge to pass my test. Throughout my lessons he was encouraging and helpful. At times pushed me to do better than i thought i could do but it worked and i was constantly learning. I really urge anyone wanting to learn to request Kevin you wont be sorry. Simon is an amazing instructor. Really patient and supportive. Explains things at a level the student can understand and grasp. Friendly and caring, he really helped with my nerves and lack of confidence. I'd recommend him to anyone. Simon is a fantastic instructor, helped me pass first time which was a concern for me with my partner being heavily pregnant at the time. He was always helpful, showing me different ways of doing things and sending me resources to use when not behind the wheel. He was great at acomodating my need to suddenly change lessons due to my job and though he doesn’t work Sundays would do so to help me out. Would recommend again and again. Simon is a great instructor and with his help I managed to pass first time, dispite initailly being a very nervous student. He is extreamly patient and uses learning aids (apps and videos) during the lesson which were quite useful for beginners with little or no experience behind the wheel. The "debriefs" at the end of each session were also useful to hear what needed to be improved as well as the things you were doing well. I would definitely recommend him to others! Simon is an excellent instructor. He is highly knowledgeable and has got great patience. He takes extra care towards his students and ensures they are relaxed during lessons as well as driving tests. I never felt tensed while driving under his guidance. I would strongly recommend him. Simon is a great driving instructor, really friendly and supportive! I always looked forward to my lessons and am really pleased to have now passed my test! Just passed my test and absolutely buzzing!!! Kevin sir you are a ledge. I came to Kevin with so many bad habits and a lot of struggles, He took the time to show me how to be a good driver and listened to any concerns i had. Having an instructor that puts you at ease is a game changer! I passed my test first time with Simon and I have to say he's the best around. He's a very agile instructor so if you are struggling he will use diagrams/pictures to help you understand. No time was wasted, his lessons were very structured with good de-briefings at the end that gave me something to work on in my own time too. He's easy going, calm and humorous. Top Instructor!